This year summer clung to Seattle like a shy toddler, refusing to relinquish its hold. In ten days November will arrive and only now is it 37° outside. 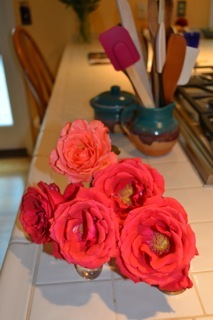 Fortunately, I rescued the last of my rosebuds two days ago and brought them into my warm kitchen where they could bloom. Today I have resurrected my socks; I am wearing my winter slacks and an extra layer under my shirt. I sit in my centrally-heated office writing about my Venetian women and I imagine them in wintertime. How many layers would they have worn to keep warm? How had the temperature of the room shifted as they stepped away from the wall that contained the fireplace? How early in the season would they have been deprived of flowers? The Seattle Times this morning verified that the rainy season has finally arrived and reported that local officials are asking citizens to help the wastewater system by clearing debris from our neighborhood drains. I imagine the water rising through the paved areas of Venice, lifting water so high under the bridges that a gondolier must bend over to pass under. Were my women even more confined than usual? Could they smell the garbage that washed back towards their homes? Did the walls of their rooms exude dampness? The change of the seasons, so dramatic for us on Puget Sound this year, transports my mind back to earlier days in another part of the world. I travel there in my imagination, grateful that my body lives in the present time, warm, dry and smelling the last of the roses. That's a great picture - I can almost smell them here in Madison Park!